By Jay Fitch, Ph. 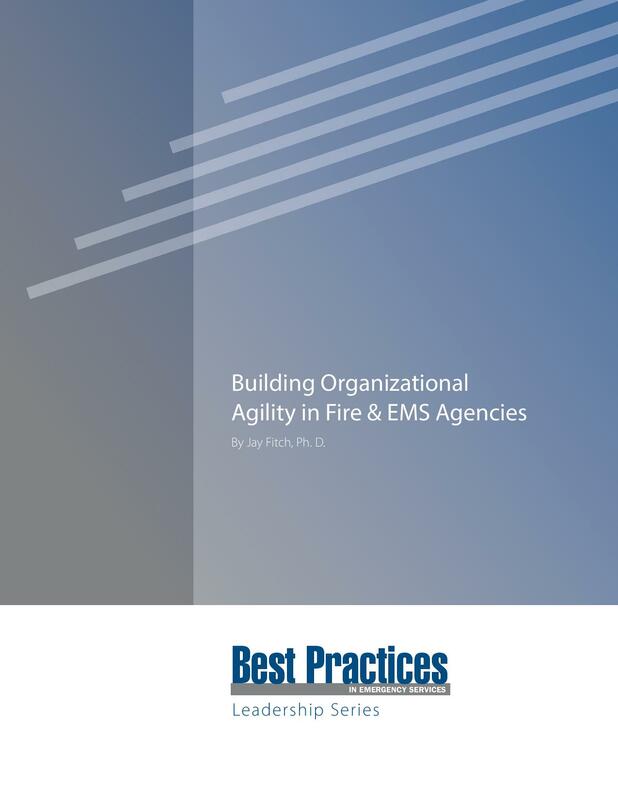 D.
For fire and EMS agencies, building an agile organization allows leaders to be alert to both internal and external factors, opportunities and challenges, and to focus on the future rather than the past. Agile fire and EMS agencies maintain operational, clinical and financial processes that are adaptable to changing resources, changing demands and new models of service delivery. Agile organizations engender performance and accountability at all levels. They constantly expand their capability to use all available resources in a timely, flexible, affordable and relevant manner to respond to change positively. Have you ever wondered why some emergency services agencies glide through uncertainty and major change while others crash and burn? It’s an important question given what lies ahead. One Midwestern EMS organization we work with continually seeks to improve its service capabilities; leadership wants to understand what’s coming, to be ready for the next wave of change. They proactively work with their internal caregivers, other public safety colleagues, local elected officials and their base hospital leadership. They are widely respected and known for clinical and operational innovation. This organization and its people are growing, but it hasn’t always been that way. Leadership made a conscious decision to develop from almost being reactive (some would say comatose) as an organization to being fully alert, proactive and setting the pace for others. This organization is agile. Contrast their results with another department just 30 minutes away that is struggling to escape its past, let alone prepare for the future. Managers there feel victimized as service demand has soared without a corresponding increase in tax base. In short, they’ve paid lip service to change but now seem to be struggling mightily. Relationships internally and externally have soured and are frustrating for all concerned. They are not meeting response times, and trust levels are low. There is little energy or capacity to prepare for the health care changes ahead. This organization is fragile. Let’s step back and look at the origins of the organizational agility concept. Initially coined in a flexible manufacturing context, it emerged as a business model as “Lean,” “Six Sigma” and other improvement processes were implemented in manufacturing, service industries and, more recently, health care. An analogy may be helpful in understanding how agility works. Automobile racing, from the Indy 500 to NASCAR, is a fast-paced sport filled with uncertainty. The environment in which emergency services leaders find themselves today may be likened to the chaos that can occur during a car race. If one fails to pay attention and make the right moves, it’s highly likely you’ll hit the wall and lose any chance of seeing the checkered flag. Whether you follow racing or not, what’s been consistent over the 125-year history of the sport is that successful drivers spot a fleeting opportunity and take advantage before the moment passes. Similarly, agile organizations consistently identify and capture opportunities more quickly than their rivals. In racing, just as in emergency services, technology and the pace of the race continue to increase exponentially. And while the driver—the leader—is critical, it takes an entire crew, all working together, to be successful. Researchers from diverse disciplines approach organizational agility from a variety of perspectives. Most agree that when organizations are not agile, they become “fragile” or less effective. Taken to the extreme, agencies become susceptible to factors that slow them down or can even be career-ending for their leaders. The illustration below shows a variety of factors that impact an organization’s agility. Each can be analyzed along four dimensions: awareness and alertness; leadership orientation; high-value processes and structures; and development of a performance-based culture. In this series we will look at each factor, evaluating its effect on agility, through the prism of the four dimensions. How alert is our organization? Do we have the strategic foresight to see what the next five years will bring, or are we still looking in the rearview mirror? How well prepared are we to deal with the full spectrum of those changes? The difference between aware and alert can be subtle but is important. Have you ever been around someone who, at every point in the conversation, drifts back to something that happened years ago? The conversation usually begins: “When I was a medic, we had those same problems, but …” I usually can’t wait to get away from these time travelers—they drain my energy. Future orientation about the change and the complexities we must master is a core element of leadership agility. Look in the mirror. If you are constantly telling stories about the past rather than talking about a preferred future, you could be a time-traveling leader. Are your systems and processes the result of history and inertia? You may be using the latest ePCR, but if your improvement activities are focused on finding errors rather than building caregivers’ competency, capabilities and compassion, then your processes are not supporting agility. In a current example playing out as I write this, the Los Angeles Times is reporting daily on that city’s fire department response-time problems, highlighting fragile systems and processes. If your agency’s deployment and staffing approach is centered on strategies that have not been re-evaluated and modeled, or the validity of your data has not been tested in the past 24 months, you may be slipping from agile to fragile. Tradition-bound organizations present performance and accountability as a strategy. These leaders have performance-driven culture in their heads or on their lips, but not necessarily in their hearts. Agile, future-oriented departments and agencies live a performance-based culture in which everyone from the CEO or chief to the logistics support team comprehends what performance and accountability actually mean in terms of philosophy, processes and tactics. It is part of the organization’s DNA, and it becomes inherent within every employee. When working with a client in the eastern U.S. to develop a performance-based culture, we began by creating a compelling vision that included high levels of participation, empowerment and teamwork. Senior leadership understood that collaboration, decisiveness and candid, constructive conversation had to become the norm. In the months that followed, leaders had to live the vision and celebrate the little wins to build confidence. Different shifts became laboratories to create this type of culture, and shift leaders worked to promote and encourage this culture for the crews they led. With this approach, leaders not only coach their people, but they also actively solicit informal feedback and work to change their behavior in ways that are beneficial to the organization and themselves. When it comes to being agile, culture beats strategy every time. Leaders of traditional organizations often describe achieving performance goals or ensuring staff accountability as a game-winning strategy. For agile agencies, performance-based culture is more a reflection of the organization’s values, which influence all actions and every decision associated with the execution of strategies and tactics at every level of the organization. To recap, an agile organization is alert to internal and external factors, opportunities and challenges. Leaders face forward rather than focus on the past. They work hard to ensure that their operational, clinical and financial processes are adaptable to new models of service delivery. Performance and accountability are woven throughout all levels. Being agile means constantly expanding capabilities to use all available resources in a timely, flexible, affordable and relevant manner to respond to change positively. EMS agencies and fire departments that are able to spot and seize game-changing opportunities have a high degree of organizational agility. They do this by ensuring a close knowledge of, and insight into, their customers’ attitudes and behaviors, but also by constantly monitoring the environment to understand competitive threats. Following is an exploration of customer service and competition as viewed through each dimension of agility. Most service leaders are aware of both customer and competitor issues but are not alert to changes until they become a full-blown crisis. As an example of this, we recently worked with a service that couldn’t understand why their volume was dropping. They didn’t become alert to changing customer needs until after a contract they had held for two decades was awarded to a competitor. It was a crippling blow. Have you personally interacted with top executives of your three largest customers in the past 30 days? What events, if they occurred, would pose a threat to your customers’ view and support of your organization? What are the indicators routinely used to track your competitor’s activities in the market? In our client’s case, management came to realize that it had been almost a year since they’d had any significant social interaction with the executives of their top customers. Remember, customers buy from “friends,” and they will give a friend an early warning when there is a problem or potential problem. In this case, management had not anticipated what might undermine their relationship with key customers or how to mitigate the impact. This inattention made the relationship more fragile. The organization had seen more (and newer) units from the competing service at local hospitals, but they didn’t understand the significance. Being alert to early signs of change is difficult: The signs are soft when you first notice them and may seem to be only an impression. But pay attention to your intuition. Assimilate multiple sources of information to help identify an early trend that can be acted on to preserve and enhance an existing customer relationship or a trend that tips off a competitor’s strategy. When we first became customer advocates and began teaching customer service, a senior supervisor at one company bristled and told me, “We’re a 911/emergencyonly service. We don’t have customers—we have victims.” Over the years, I’ve often chuckled and realized that he was right: Anyone with this attitude victimizes customers! Expanded and improved customer and caregiver relationships are essential as the pace of change increases. There are seven key customer groups that you must pay attention to: patients, family members, bystanders, co-responders, clinical staff at the hospital, administrative personnel at facilities and, last but not least, our own caregivers. Leaders have to be oriented to discovering and acting on changes in expectations within each group to ensure that their organization is agile. Likewise, agile leaders are savvy about competitors’ actions and anticipate potential strategies and tactics. “We mail comment cards to all of our customers, and those returned have an 88 percent positive rating!” The EMS chief who said this went on to admit that her agency doesn’t actually send cards to people who die or refuse care, or to facility personnel. Then she sheepishly confessed, “We don’t really do anything with the cards except tally them up once a year.” Agile organizations, on the other hand, take relationships seriously and use processes and systems to make sure caregivers and administrators take action. 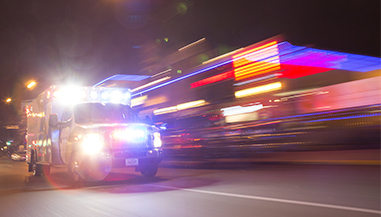 Most emergency services accept the accelerating pace of clinical technology. But when it comes to management technology, there are fewer early adopters. A variety of next-gen processes are available, but few have been widely implemented by ground EMS providers. One of the most interesting and cost-effective of these processes, and one that helps EMS improve customer insights and agility, is called RSQ911 Solutions, developed by Bill Gerard, M.D., an EMS medical director. RSQ911 was recently implemented by Air-Methods at more than 100 air medical program sites. Through a web based survey system, quick e-mail surveys are used to inventory the perceptions of patients and other customer groups. RSQ911 provides metrics and insights outlining opportunities for improvement and areas of success to recognize and celebrate. It integrates with EPCR software and provides benchmark data for other services using the system. One of the most innovative features is the leadership e-mail alert system, which prompts immediate customer problem resolution. Technology can help you stay alert to changing customer perspectives, but culture is king when it comes to organizational agility. It’s more important than technology; it’s more important than data. In fact, culture wins hands down. A performance-based culture compels caregivers to go above and beyond when it comes to customer service. Both public- and private-sector examples of performance-based EMS customer service cultures exist: Phoenix Fire and Acadian Ambulance are both known for outrageously positive customer service. What makes these two organizations legendary? Their cultures support individuals at all levels doing the right thing. Performance and customer service are part of the fabric of the organizations. They expect it, measure it and hold members accountable to it. Howard Shultz, CEO of Starbucks, sums up the customer service requirements for leaders in a performance-based culture this way: “Care more than others think wise. Risk more than others think safe. Dream more than others think practical. Expect more than others think possible.” Starbucks uses its deep customer and competitor insights to make game-changing decisions, and their success at building a highly successful coffee company with sales of $9.8 billion proves it. They are also, not coincidentally, among the most agile organizations on earth. I recently observed a multi-victim incident response on an interstate highway. From the hand signals and terse discussions in a difficult location, it quickly became apparent that fire-rescue, medical and law enforcement’s ability to communicate was limited. Communication interoperability is clearly understood in this context. But when discussed in the framework of an organization’s internal need for effective communication, it becomes less clear. Emergency service agencies are typically organized around functional internal departments that specialize in given tasks. With this approach, work groups erect fences around their duties and build silos of information. They become specialized and territorial and want no overlapping. Each territory or silo needs to be protected by department managers, who may fear for their jobs. Silos become obvious when different shifts at the same station don’t communicate, when the communications center doesn’t play nice with field operations or when maintenance/logistics doesn’t work well with county purchasing. There are key characteristics and opportunities to reduce silo thinking and improve outcomes that can be gleaned from reviewing cross-functional communication issues through each dimension of agility. Being alert to “communication ischemia” between individuals, within work groups and between cross-functional teams is like watching a heart attack evolve. Sometimes it’s dramatic, but more often, seemingly insignificant warning signs occur. In agile organizations, leaders are alert to early signs that communication and interoperability between work teams are becoming constricted. Early symptoms of narrowing cross-functional teamwork can include ambiguity around direction and organizational priorities, excessive analysis, discussions and decisions that are routinely revisited, low trust and strained interpersonal relationships. If left unaddressed, these symptoms encourage the silo mentality and further constrict communication, which is the lifeblood of any organization. Agile organizations pay attention to those early signs and practice “preventive medicine” to enhance communication up, down and throughout the organization. Skillful and consistent communication from leadership is essential in times of uncertainty. While many leaders agree, not all are sure how to go about practicing this type of personal communication. At worst, leaders become living examples of communication barriers; at their best, leaders model clarity, trust and accountability by their communication style. Skillful communication can be exemplified by listening well, sharing appropriate and timely information, recognizing perception and interpretation differences, and picking up on nonverbal cues when meeting face to face. Agile leaders are willing to engage in difficult and important conversations to achieve positive outcomes; they also welcome upward communication. When caregivers and management take responsibility for communicating new ideas, innovations and better ways to get the work accomplished, agile leaders are receptive and use those opportunities to build even stronger relationships and outcomes. Agile organizations use data to develop and communicate information across departments and functions to achieve organization-wide results. In fragile organizations, department heads become information gatekeepers who guard “their” data. This makes timely coordination and communication among departments difficult. When gatekeepers create their own nonintegrated mini-data systems (think dispatch, HR, scheduling or billing), it makes it difficult to see the big picture. There is a story about a large EMS system that was struggling a few years ago to keep its fleet on the road due to a diesel engine issue. Maintenance personnel knew the issue and solution, but because the agency’s communication processes were fragile, the city purchasing department ended up buying additional vehicles to solve the problem. You guessed it: They bought new vehicles with the exact same engine. While I don’t know if this story is true, it makes the point! One essential aspect of improving cross-functional communication is managing the natural conflict that may arise when team members have different values, attitudes, expectations, roles and responsibilities. Fragile leaders view conflict negatively and avoid it. In this environment, back-channel politics and personal attacks thrive, and team members talk about each other. In contrast, agile leaders “mine” for conflict, extracting and encouraging all team members’ ideas. Team members talk to rather than about each other. Agile leaders will proactively name critical issues, putting them on the table for open discussion. A performance-based communication culture institutionalizes the disassembly of silos. Doing so ensures that the organization’s goals are primary rather than those of a section, department or individual supervisor. It reduces internal competition and enhances cooperation, collaboration and process transparency. The culture in agile organizations encourages members to discuss and challenge business practices, values and work processes. Through cross-functional conversations, the agency discovers ways to improve system-wide adaptability, optimize internal systems, implement meaningful change and measure the impact. This component can be summarized by a quote from John Powell, composer of the scores for The Bourne Identity and 50 other films, who said: “Communications works best for those who work at it.” Agile organizations work at cross-functional communication creatively and consistently. An example of excellent cross-functional communication is the PULSE Process pioneered in Pinellas County, Fla. PULSE brings supervisors from multiple internal departments together on a daily basis to review performance and causative factors and to make improvement decisions. Throughout the organization, work processes must be designed to share meaningful information that can be rapidly used to improve results. In this economic environment, fragile organizations tend to take a wait-and-see approach. Agile organizations, on the other hand, are proactive, investing energy in multiple strategies so that they are able to take strategic advantage when the time is right. They understand that preparing for change means being good stewards of all resources, including people, money, capital and other organizational assets. Now let’s take a look at financial stewardship as it relates to the four dimensions of organizational agility. There are diverse opinions as to whether EMS is alert to proposed changes in funding mechanisms. In a recent survey that we conducted at Fitch, almost two-thirds of the chiefs responded that they highly agreed with the statement, “Changes in funding mechanisms are recognized at all levels as a factor likely to impact future fiscal sustainability.” Among caregivers, less than one-third rated the same statement highly. This demonstrates that EMS leaders think there is broader understanding of the impact of health care reform and awareness of other financial issues than may actually exist. The survey results underscore the point that we must communicate financial matters to our staff and teach fiscal stewardship. Leaders must be alert to how decisions made by individuals at all levels will affect the financial health of the organization. Several months ago, we were charged with developing future options for a major department. When reviewing the draft plan, one chief officer complained, “You didn’t present an option that involves significantly expanding our subsidy.” This leader obviously is not in touch with the community’s financial situation. Being truly alert to our changing financial reality can be likened to the story of how one boils a frog. It’s said that if you toss a frog into boiling water, it will hop out and keep going; but if you place it in a pot of cool water and gradually raise the temperature, it won’t. Agile organizations keep going; fragile organizations get financially boiled when they don’t pay attention. Leaders of fragile organizations rely primarily on key performance indicators and spreadsheets to constantly prune expenses when under pressure. Agile organizations take a more strategic, long view to ensure that they remain good stewards by increasing revenue sources or radically rethinking how the work gets done to decrease costs without negatively impacting patient outcomes— or, in the case of fire departments, dollar losses from suppression. Well, not only are they surviving—they’re getting What evidence supports the way we are doing business? What are the opportunities to rethink the way we do our work, and how do we employ them to our stakeholders’ financial advantage? some big recognition for their efforts. REMSA recently was awarded one of the coveted Center for Medicare/ Medicaid Services innovation grants to create a community health early intervention team (CHIT). The $10 million, three-year grant will be used to develop the team, which will respond to lower-acuity and chronic disease situations in urban, suburban and rural areas of Washoe County. CHIT is designed to reduce unnecessary ambulance responses, as well as hospital admissions and readmissions, while improving patients’ health care. A central component of the program will be the adoption of a new, nonemergency phone number to provide an alternative pathway to care for patients with lower-acuity problems. Over a three-year period, REMSA’s program will train an estimated 22 workers and create an estimated 22 jobs. The new workforce will include community paramedics, communications specialists, an educator, continuous quality improvement coordinators, an outreach coordinator, an information technology specialist, a statistician, an administrative support specialist and a project director. Savings from the program are expected to exceed the expenses associated with the demonstration grant and, if successful, will yield a significant return to the community. But it takes more than executives thinking outside the box for organizations to be good financial stewards. Accountability processes need to be in place to ensure that all runs are correctly accounted for and billed, validating that outside vendors are not overcharging for services or supplies and that crews are not calling off and then taking overtime in a way that maximizes costs. These routine processes are part of practicing fiscal stewardship. It also involves making good, thoughtful decisions on a daily basis. Do we really need the additional unit this week to achieve response times? If not, can it be used to accomplish other important projects that the supervisors don’t have time to get to, such as catching up on QI processes or supporting community/marketing efforts? Agile organizations flex to constantly use all available resources to support the organization’s mission. When fiscal stewardship is part of the organization’s culture, it’s part of everybody’s job to seek out these opportunities. Culture is important to an organization’s agility because it is the shared values and beliefs that help individuals understand how the organization functions and that provide them with guides for their behavior. And in the event that strategy and culture are not interconnected, culture wins. I remember, when I was a basic EMT, using gauze pads as note pads and then discarding them. One of my partners, who had recently completed a light duty assignment in purchasing, grabbed my arm one morning and said, “Hey, do you know how much that waste is costing us? You’re spending our raise.” This system had a culture of stewardship where individuals recognized that little things could have a big impact. Agile organizations begin teaching stewardship by including it in the organization’s vision and values statements. They might include a statement such as, “We take responsibility for our operational and financial performance, both the results achieved and the resources consumed to achieve them.” In new employee orientation and ongoing management briefings, the importance of how both operational and financial processes work together should be addressed. Other strategies to weave stewardship into the culture include providing timely feedback on costs and budgetary performance, particularly those items that caregivers can have an effect on. Reinforcing those actions with meaningful incentives also underscores the importance. For example, funding a significant gain-sharing program tied to extending the useful life of vehicles is one way to anchor positive behaviors. Performance can be tied to particular shifts or to individuals by using devices such as Road Safety to develop individual performance metrics. The opportunities to teach and model stewardship are endless for EMS. These efforts can become a strong positive focus for organizations that link strategy and culture and help move your system toward higher levels of agility. Fragile organizations let changing priorities disorient, distract and be destructive. Agile organizations and leaders break through the cacophony, deal with the crush of activities and focus by prioritizing issues based on the organization’s mission, vision and values. Now let’s take a look at managing changing priorities through the four dimensions of organizational agility. If people are directed to stop one project and start another, there’s a risk that nothing ever will be completed as tasks fall off the bottom of the triage list and into a black hole. Agile leaders are alert to changing priorities and how they impact the organization’s performance; fragile leaders are clueless to what is occurring until they hit the wall or the bottom of the hole. Part of the underlying problem is that everything comes at us so quickly in times of rapid change. Everything is a priority. It’s like being in an unfamiliar city late at night at the end of a long trip: You’re tired and trying to follow ambiguous directions to your hotel. It’s raining and everyone is driving twice as fast as they should. You get distracted and miss the turn, becoming even more frustrated. You thought you were heading in the right direction, but now you are hopelessly lost. Agile leaders understand that it’s best to pull over, take a deep breath and become more alert and focused rather than risk crashing while frustrated or distracted. Are you agile or fragile? Do you suffer from “leadership fibrillation,” with lots of electrical activity but no meaningful throughput? Agile leaders send a focused signal that allows the appropriate nodes to act; fragile leaders send multiple electrical impulses, confusing the receptors and facilitating fibrillation. Setting priorities and sending a clear message that doesn’t confuse is essential during periods of uncertainty. Staying in balance, triaging priorities and providing appropriate direction are mandatory if you want to be an agile leader. In periods of high stress and change in the professional realm, we must remember that our lives are made up of seven vital areas: health, family, financial, intellectual, social, professional and spiritual. To be an agile leader, we can’t neglect any one area (never mind two or three) without affecting the others. Much like a table, if one leg is longer than the rest, it makes the entire table wobbly. Developing processes and structure can help us prioritize the priorities and be disciplined in our leadership. Being a bit more pragmatic, agile leaders develop a work plan detailing critical priorities. Ideally they get plans signed off by the city/county manager or company owner, knowing that they may be tossed for new priorities at any time. If that does happen, they can at least go back through each of their previous plans and chronicle the results they achieved. What must not happen is for the chaos of changing priorities to obscure the ability to achieve results. Having detailed work plans will also help manage your own equilibrium. For now, you may have to simply accept that you’re going to experience turbulence, but having a plan will at least put as much of the process as possible under your own control. Finally, keep in mind the wisdom of Christine M. Riordan, the dean and a professor of management at Daniels College of Business. She wrote in a recent Forbes Magazine Leadership Forum that many change initiatives fail because leaders treat them as events rather than as processes. Fragile EMS organizations are often beehives of activity and hard work that generate little practical return. Fragile managers confuse “busy work” with results; agile leaders work to develop a culture throughout the organization where setting priorities to achieve results is part of the organization’s basic framework. Does this problem relate to our top goals, or is it a distraction? Is this problem important enough to warrant changing our priorities? What is the simplest way to resolve this that will allow us to meet our goals? If we’re struggling to meet our goals, which goal can we drop down to priority #2? There are examples throughout EMS of organizations that have developed a culture that allows leaders and followers to stay focused on the prime directive rather than on constantly changing priorities. That’s agility! Jim Collins, author of the best-selling Good to Great, talks about the importance of looking in the mirror and out the window. In his decades of research, he’s found that great leaders look in the mirror when things go wrong and accept the blame themselves. They also look out the window for other people to credit when results are good. When others besides the leader receive credit for the organization’s success, innovation—rather than bureaucracy—flourishes. Is your organization’s leadership encouraging new ideas and the risk associated with trying something different, or are they sowing the seeds of bureaucracy, allowing a “blame game” culture to squelch fresh perspectives? This month we’ll assess the trap of bureaucratic, non-value-added activities through the four dimensions of organizational agility. Bureaucracy can sneak up on an organization incrementally, often under the guise of the need to standardize, control or be “fair.” See how your agency measures up. In many cases, a written request is made, then another individual checks the records to make sure there is sufficient leave available to be granted. Then it’s up to a supervisor to communicate that the leave is approved. Then someone else calls 10 to 12 people who don’t want to take the shift. Eventually someone is found to take the shift. Let’s look at another example from outside of EMS. I recently had an outpatient EKG, and it quickly became apparent that their processes were very bureaucratic. After signing in, there was registration and insurance verification before the EKG could be taken. They demanded a copy of my insurance card despite my telling them I was paying cash. Multiple stations were required to complete registration. I had to wait for the second registration person to finish another client’s paperwork. Then I was sent to outpatient cardiology, only to wait for the paperwork to be transmitted the 25 feet around the corner from registration. Once it arrived, there was an additional wait for a room to open up to take the EKG. Moving into the room, I waited for a technician to run the EKG. They wanted me to wait for the cardiologist to read the EKG before I left. A typical EKG takes less than five minutes. When the entire process takes 60 minutes, 55 of those minutes are non-value-added, as are all the additional steps by the patient and staff. Agile organizations identify, eliminate or simplify nonvalue-added steps. This mindset is often a breakthrough in thinking for many EMS groups. Currently, the accepted wisdom is that everything we do in EMS is value-added because it is “how we do it.” However, 95 percent of typical activity in any process is non-value-added. EMS can experience significant productivity gains and have happier customers by identifying and creatively chipping away at those non-value-added steps. Would you wait 30 minutes for a hamburger at a fastfood restaurant? Of course not. Most well-run fast-food chains have already eliminated a significant portion of non-value-added steps from their food service processes. That’s why you get your meal in a few minutes. Your agency’s culture may seem innocuous, but bureaucratic cultures are kryptonite to agile organizations. And, unlike in the Superman comic strip, there is more to be done than simply removing the kryptonite in order to get more value. Culture shapes the way the work gets done and how people think. The culture of a fragile organization rein forces bureaucracy and mediocrity. In contrast, an agile organization develops an environment in which everyone is empowered and expected to ask, Does this process create value? Agile organizations are constantly looking for ways to manage and reduce the resources and costs associated with non-value-added activities. More important, they habitually innovate, adjust quickly to new business conditions and seize emerging opportunities before competitors do. Agile organizations perform efficiently today while continuing to explore new sources of value for tomorrow. Part 7: How to measure key performance indicators and align incentives forces bureaucracy and mediocrity. Early in my career, an ambulance owner I worked with decided to increase productivity by implementing a $1 incentive per completed non-emergency transport. This quickly became known as the “buck a body” program. As you might imagine, the unintended consequence was that in the rush to collect their transport bounty, caregivers hurried through their duties, provided less care and were less than polite to customers. Clearly there was no alignment between improving a key performance indicator (productivity) and the actual result (loss of customers). Let’s take a look at the difficult task of measuring key performance indicators (KPIs) and aligning appropriate incentives through the prisms of the four dimensions of organizational agility. In the early years of modern EMS, no one worried about measuring fractile response time targets, unit hour budgets, satisfaction levels and such things. We were focused on “healing the sick and raising the dead.” Everybody loved the medics! However, through the years, our ability to impress community and clinical leaders without metrics and measurement has been eroded. Agencies that are alert to the changing environment become more agile while those that are arrogant and selfrighteous become increasingly fragile. Measuring KPIs and aligning appropriate incentives for clinical, operational and financial performance is central to becoming more agile. If the boss doesn’t “get it,” success in aligning incentives to support improved performance is nearly impossible. Early metric-driven incentives were generally focused on the financial aspects of the EMS organization by either claiming to increase profit margins or reduce costs. They were not always successful; driving down costs would sometimes come at the expense of quality, turnover and lost expertise—or even losing some of your customer support or market. Fragile organizations today remain primarily focused on financial incentives rather than using a more balanced approach that includes aligning process improvement, customer satisfaction, and learning and development of those within the organization. These four pillars are the basis of today’s modern “Balanced Scorecards.” Scorecards gained notice 20 years ago after an article was published in the Harvard Business Review, and they have become a well-accepted way to report performance on KPIs today. Current research suggests that world-class organizations are 159 percent more likely to have mature Balanced Scorecards in place than less successful organizations. And a 2008 study published in Advances in Accounting found that among 164 publicly traded organizations, those with well-deployed Balanced Scorecards outperformed the control group by nearly 30 percent. It’s clear that leaders who are focused on the future and who can align multiple levels of incentives, appropriately matched to the generational specific motives of caregivers, encourage agility and outperform fragile leaders who are focused on the past. Financial performance: Revenues, net earnings, return on capital, cash flow/days in accounts receivables, etc. When working with clients, we suggest that for each high-priority process, they need to deeply understand the current state based on quantifiable operational data, using process maps and analysis to help identify major gaps between present and desired performance levels. It’s a bit tricky because the stated issue isn’t always the real problem. For example, in a community we recently worked with, it became clear that the stated “employee out of chute time” issue was a system problem with several root causes. The time stamp was occurring at an incorrect interval and the station configuration (crew quarters at the back of the station on the second floor) impacted the ability to reasonably perform. In this case, response times by crew were posted, with top-performing crews receiving recognition at monthly caregiver meetings. With consistent reporting, recognition and reinforcement, competition between crews led to an overall response time improvement. The incentive in this case was recognition and positive reinforcement. An EMS organization’s ability to become agile and differentiate itself from others relies heavily on its capacity to foster innovation and to achieve and sustain a strong competitive position. Balanced Scorecards offer a holistic and detailed view of performance by framing strategic objectives within a balanced set of areas that contribute to the agency’s success and agility. They accelerate the process of embedding process improvement into every aspect of the organization so it becomes a central part of the culture. Properly measuring KPIs and aligning tangible and intangible incentives at multiple levels of the organization to reinforce desired behaviors supports organizational agility as EMS deals with the ever-increasing pace of change. Responding to a critical call on a foggy night used to make me crazy. You couldn’t see the edges of the road, never mind 20 feet ahead. It was disorienting. We knew we needed to get there; we just weren’t sure how. The pace of change that emergency service organizations are experiencing today is like driving a 4-ton ambulance down a murky rural highway with the accelerator stuck wide-open. When an agency’s processes are not fully transparent, it can be as disorienting to caregivers and customers as driving in a dense fog. Organizational agility is about managing opportunities (taking the shortest route to the destination) and mitigating risk (not running off the road and crashing) in the midst of change. There are four key aspects to becoming more agile: awareness and alertness to changing dynamics; the ability to lead change; the processes the organization implements to accomplish the work; and, last but not least, the creation of an organizational culture that supports and reinforces agility. Now let’s take a look at creating a culture of openness and transparency through the prisms of the four dimensions of organizational agility. Many organizations fall to the bottom of the coma scale when it comes to being alert about why process transparency is important. In a word, it’s about trust. When organizations fail to make processes transparent, caregivers write their own script about the organization’s intent. At best it’s rarely accurate; at worst, staff can be downright disingenuous in reacting to situations when what they are told doesn’t match what they see. Agile agencies are hyper-alert to making sure process transparency shows organizational intent through the actions of its leaders and members. Many organizations fall to the bottom of the coma scale when it comes to being alert about why process transparency is important. In a word, it’s about trust. Some leaders mistakenly believe they don’t have to be either transparent or accountable. A director I know recently told caregivers that despite his best efforts, funds for new stretchers weren’t approved and would be delayed until the next budget year. In the midst of the staff meeting, an EMT pulled up the city council’s finance committee minutes documenting that the stretcher replacement request had been approved and that the replacement of the director’s vehicle had been approved but not funded. The director subsequently admitted that he’d used his discretionary authority to reprioritize items and purchase his new vehicle, thinking the caregivers would never know. In this case, the committee’s processes were more transparent than the director had anticipated. His credibility was destroyed, and he abruptly retired. Agile leaders work hard to be fully transparent and honest in word and deed. There is a saying among consultants that things that are objectively measured and reported get improved. And those things that get publicly reported get improved more quickly. This can be applied to a wide variety of emergency service processes. Leadership processes including human communication, clinical improvement, operations/deployment, technology and information systems, human resources and financial processes can be problematic if not transparent. When caregivers don’t understand why a process exists or how important it is, or if it does not appear to be consistently applied, then that process becomes opaque. A great example is the annual “evaluation,” or the process of performance appraisal. In fragile organizations, this process is shrouded behind “HR mumbo-jumbo.” Most caregivers don’t understand how they are rated; what parts of the appraisal are subjective vs. objective, if it is objective; and, most important, why their co-worker got a bigger raise than they did. The lack of transparency behind appraisal processes is a trustbuster and can be a strong de-motivator. CAD and ePCR systems are another example. They are obscure and hard to change, and the use of programming languages—code—to specify how they work makes them hard to understand to any but the most technically adept. Agile EMS organizations engage people at multiple levels to develop a broad understanding of what the systems do, how the processes work, and how they help both the caregiver and the agency do the job more effectively. While these systems may still be somewhat difficult, engagement helps clear the fog. For agile agencies, performance-based culture is a reflection of the organization’s values, which influence all actions and every decision associated with the execution of strategies and tactics at every level of the organization. It didn’t take a lot of probing for the floodgates to open. She said that frustration levels were high because no one really knew what was going on. “We know things are changing,” she said, “but we don’t know what’s expected.” This is a clear example of a fragile culture. Openness needs to be a cultural cornerstone in a truly agile organization. Increasing transparency makes it easier to see how something actually works, which makes it easier to change how it works when needed. A faster response to a needed change improves overall organizational agility. To sum up, make your processes more transparent and your culture more open and less secretive. Lift the fog of mistrust so leadership and caregivers can see both the edges of the road and a positive outcome—the destination—more clearly. A supervisor of a small EMS agency recently told me with some pride of his chief’s willingness and skill in serving as a coach and mentor for employees at all levels of their organization. “His effort has been crucial for us to retain talent and respond to change,” he said. I’ve personally known the chief for many years, and to his credit this charismatic but often impatient man has recognized that the diplomacy, empathy and consideration of others’ feelings required of relationship-building doesn’t come naturally to him—but he’s made it his goal to get better at it. And, sure enough, adding the coaching dimension and using it to build relationships helped the agency move from a fragile organization to one that is widely considered as being agile and progressive. Since the leadership capabilities and skills required for agile organizations parallel the Big Six, let’s look more closely at these competencies as they apply to the four dimensions of organizational agility. The world is becoming smaller, more interconnected and faster, resulting in the need for organizations to have managers with both divergent and convergent powers for analysis and decision-making, a Big Six competency. Divergent thinking is an ability to look beyond the conventional assumptions and paradigms that can blind leaders to deeper truth and trends that may not initially be obvious. In the recent financial crisis, divergent thinkers quickly became aware that issues of smaller subsidies and service cuts were not simply a matter of “waiting it out” with incremental changes. Rather, they took action to proactively manage a sea change in how services were provided and paid for. Once all the options are laid out, agile organizations then display convergent thinking—they not only know how to make a decision, but they know how to sell and implement the decision relatively quickly. This can involve some risk, but agile organizations weigh that against the very real harm of inaction or waffling. Like many services, the agency I spoke of earlier is experiencing change on multiple levels. Costs are increasing while reimbursement declines; competitors are encroaching on their service area while quality and accountable care components are becoming more challenging. Common sense would seem to dictate the extreme importance of competent leadership, especially in these turbulent times … but how often have you seen agencies skimp in the selection process or in leadership development? Agile organizations assess current and future leaders against the Big Six competencies, hiring and promoting those who show potential and also providing resources for professional development in areas where leaders may fall short. Agile leaders are constantly looking at ways to improve themselves, seeking honest feedback and even looking outside their direct experience in EMS to other professions for ideas and help. Agile leaders are particularly good at communication and understand how important clarity is around mission, roles and values—no matter the medium selected or how formal or informal the communication. I’ve observed a direct correlation between an organization’s agility and its leaders’ understanding and demonstration of the Big Six behavioral competencies. As Griffiths says, time is a leader’s most precious resource. The Big Six competency of organization and planning translates to efficient systems and processes in which delegation is used wisely. Forward-thinking leaders ask employees to consistently find better ways to do their work. This means staff are motivated and rewarded for finding ways to serve customers better, make improvements in operations and come up with ideas that will save time and resources. Agile organizations then institutionalize these best practices through systems and processes that ensure they’re not solely dependent on one individual’s passion, but can be duplicated throughout the organization. The Big Six are leadership touchstones that are integral to creating a performance-based culture, one in which success is determined by measurable objectives as a reflection of the organization’s values and priorities. Performance accountability on projects and tasks at all levels of the organization is a critical characteristic of agile organizations. And remember—it’s the vision and values that guide decisions and priorities. In Connecting the Dots: Aligning Projects with Objectives in Unpredictable Times, Harvard Business School professor Warren McFarlan and consultant Cathleen Benko suggest that an organization’s project portfolio should be like geese flying in formation—that is, in perfect alignment to get maximum results and the least amount of turbulence. Fragile EMS organizations evoke the image of driving in a cross-country demolition derby rather than of graceful birds flying smoothly in formation. Agile organizations have clear performance standards for employees but encourage them to make the additional effort to be “best in class.” Two recent examples of this come to mind for me: During a recent post-holiday sale, I watched an engaged retail worker pick up trash on the store floor, even though the boss wasn’t watching. The second example was when a TSA agent pulled a suspicious bag to be searched, even though it was the last bag at the end of his shift. Of course it was my bag, and even though I was not above doing some good old-fashioned grumbling, I was glad to know they made the extra effort to keep everyone safe. In EMS, “best in class” means exceeding expectations and going beyond minimum standards—doing what’s right even when no one is watching. Throughout this series, we’ve looked at four primary perspectives when evaluating how agile an organization is: how aware and alert the organization is to change; what leadership’s orientation is; whether the organization’s processes and structure reinforce or undermine agility; and, finally, if performance-based measures are part of the organizational culture. Let’s look at how each affects, or is affected by, the factor of responsibility and accountability. As Leonardo da Vinci said, “Iron rusts from disuse, stagnant water loses its purity, and in cold weather becomes frozen; even so does inaction sap the vigors of the mind.” Are you using your powers of observation to proactively question clarity around roles, responsibilities and accountability? This is an insidious issue for many emergency service organizations, leading to staleness and complacency. In challenging times and during periods of significant change, you must not let yourself become complacent. After all, our clients are not complacent, the market isn’t complacent, and our political and financial masters (from local councils to Medicare and the Office of the Inspector General) aren’t complacent. If you are complacent, you become fragile very quickly. So how does an organization stay proactive and alert? It involves probing whether there is, in fact, clarity (agreement) on what’s to be done, who’s got the ball, and completion timeframes or check-in points on specific projects. More than that, it requires a clear understanding of, and consistency with, the organization’s broader mission. The best way to check if responsibilities and accountabilities are clear is to ask questions. It takes significant but valuable time to ensure that the organization is fully alert and not acting in a complacent fashion. It usually begins with the leader’s orientation to the future. “Why hasn’t this been completed?” I asked the contractor. He replied that he wasn’t sure what, exactly, I wanted. “Then why didn’t you call so I could explain?” I asked. The contractor’s excuse was that it was close to quitting time. “And, truth be told, we forgot to call the next day,” he said. We’ve all been in these circular conversations. As a leader, it’s like being trapped in a maze of good intentions, excuses and delays. For the follower, it’s like walking through a fun house. The mirrors on the wall distort the images (feedback), and the follower is sure that the trap door is going to open at any moment. These perceptions set up both leader and follower for failure. Agile leaders develop a lower threshold for alibis; they become better communicators and enforcers of what they want done. If you are more interested in being liked and popular than in holding people accountable for results, you are a fragile leader. Agile leaders accept the premise that in times of significant change, leaders need to provide additional clarity, support and reinforcement. But at the end of the day, there is nothing hardhearted about holding people accountable for high standards and making tough, often agonizing decisions concerning yesterday’s heroes, who no longer contribute. It’s tough love. Leaders must care enough about their entire staff, their futures and the welfare of the organization to hold people accountable for their actions (or lack thereof) and behaviors. What often differentiates agile organizations from fragile ones is the sophistication of internal accountability systems. Many EMS organizations achieve the minimal baseline when it comes to human resource and development processes, but agile organizations excel in this area. Managers are held accountable by their chiefs/directors for providing up-to-date job/position descriptions and annual written reviews for each of their direct reports. Accountability for performance development is reinforced by senior management during annual performance reviews. Chiefs/directors hold all department managers accountable for providing ongoing feedback and development plans. The agency tracks completion rates for performance development processes. The agency differentiates between individuals’ annual merit increases based on performance. Criteria for increases are communicated to each employee at the beginning of the year. All managers are provided with appropriate training in performance development. Weaving clarity and accountability throughout the agency is a key component of agile organizations. The greatest kind of leadership exists when your partner looks you in the eye and holds you accountable. Creating a culture of accountability means developing a climate in which people can speak openly, admit mistakes without fear and worry more about serving the customer than looking better than a co-worker. There are several cultural dimensions that can contribute to or discourage accountability. The biggest fear people have about accountability is that they will be punished for their actions. Agile organizations realize that blaming people for events that have already occurred does more harm than good. It tends to make people secretive about their actions and competitive with their co-workers. Workers end up looking out for “number one” more than for the success of the organization. Continuously moving toward clear responsibilities and accountabilities is one of the 11 ways we become agile organizations. Remember, it’s not a single event or a destination but a process. Typically it is not about any one individual; more frequently it’s about the underlying processes, leadership styles and the way you view the future regardless of your position in the organization. Throughout this series, we have focused on strategies for EMS leaders who must deal with change that is faster paced and more chaotic than ever before. This is particularly important in assessing the last of the 11 factors that affect agility: how organizations use and deploy field and administrative resources. As we’ve done before, we’ll view our last factor through the dimensions of awareness and alertness, leadership orientation, high-value processes and structures and, finally, development of a performance-based culture. We have good people and operate a better-than-average system. I don’t know why we are constantly operating at a deficit. What should we do? That was the gist of a phone call I recently received from a county manager. When I delved deeper to try to understand the problem, he told me, “Call volumes for emergencies remain constant, but our non-emergency transports are going down every year. This county’s situation didn’t happen overnight or even in the span of several years. The system’s schedule and deployment plan hadn’t been adjusted in more than a decade, even though the service area’s population grew and demand patterns changed significantly. The organization only recognized it was fragile when it could no longer cope. Its leaders had simply not seen the need for change. The former director’s orientation was to “wait and see” rather than be proactive. Contrast this to the leadership team at Richmond Fire and Emergency Services (RFES) in Virginia. The city of Richmond has a fire department with superb fire stop capabilities and an award-winning EMS transport system operated by the Richmond Ambulance Authority. The response dynamics of this city are changing as it moves through a multi-year urban redevelopment plan. Fire Chief Robert Creecy and the RFES leadership team concluded that building a more agile department was essential for continued and future success. Quite frankly, that took courage. They developed a comprehensive fire department master plan that included objectively looking at leadership styles and performance through the eyes of their stakeholders. They painstakingly quantified the use of resources, unit staffing, deployment, station locations and costs. Agile organizations welcome and reward this type of critical analysis and take action to integrate new and different ideas into planning and employee engagement processes. In contrast, fragile leaders often suffer from “analysis paralysis,” hoping that their situation will miraculously change or that additional resources will become available so hard decisions can be avoided. Systems and processes have to balance cost, performance, and both internal and external customer satisfaction. If systems fail to constantly monitor, test assumptions, improve and balance these factors, they become fragile. Intuitively, emergency service leaders understand that the only way to achieve a response time benchmark is to have a unit in the right place at the right time. To successfully plan resources, an agency needs to measure and account for the unit hour requirements for both moments of demand (the actual call requests and the system’s specific response time requirements). The sum is the total demand load on the system. For the past 30 years, unit location and call demand have been matched using system status management (SSM) strategies. In agile fire and EMS systems, the geospatial analysis and SSM plans are automated with intelligent vehicle movement systems. My colleague Guillermo Fuentes is an expert on deployment and system modeling. “Emergency services are on the verge of multiple technology breakthroughs that will advance communications and deployment processes,” he tells me. Science can help us manage demand better than ever before, but to be truly successful, we have to create an organizational culture that values performance. Employees pay attention to what their leaders focus on, so to develop a performance-based culture, leaders have to ask the hard questions. “We look at the reason for each and every response time exception, every day,” explains Rob Lawrence, chief operating officer of the Richmond Ambulance Authority. “It’s through that routine analysis of our processes that system level issues and individual performance issues are identified and can be addressed. While response time performance is a clear indicator of agility, other, more subtle signs also tell us whether an organization’s culture is deeply performance-based. For example, what is the performancerelated benchmark for the agency’s response to a caregiver’s concern or vacation request? To an external customer’s minor complaint? How are these components measured, acted on and reported within the organization? Agile organizations have leaders who anticipate and embrace change on multiple levels, rather than hide or deny the one overriding truth: Change is happening, and it’s happening quickly. They have leaders who are willing and eager to develop processes and systems to measure, anticipate and respond quickly. Last but not least, these organizations have leaders who incorporate into the fabric of the organization’s culture both an understanding of, and commitment to, superior performance. So let me ask you: Are you agile or fragile?